Foliage makes up the stunning red, yellow and green colors of Algonquin Provincial Park in Ontario, Canada during the Fall. As you leisurely drive through Algonquin Provincial Park in Ontario, Canada during the Fall, you will amazed at the amount of colour in the foliage. This park is one of the prettiest places to be in the Fall and should definitely be a destination on the top of your list while visiting Ontario, Canada. 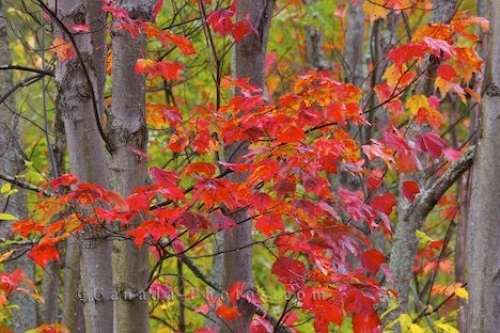 Picture of the beautiful foliage during Fall on the road sides to Rock Lake in Algonquin Provincial Park in Ontario.